Egyptian officials tried to cool tensions with Ethiopia Wednesday over the new Nile River dam project by highlighting its “neighborliness” as the Ethiopian prime minister’s spokesman insisted that nothing would stop the dam from being completed upstream from Egypt, which is wholly dependent on Nile River water. Egypt fears a diminished flow from Africa’s largest dam and hydropower station but Egyptian President Mohammed Morsi said Egypt respects Ethiopia and will not engage in any aggressive acts against the East African nation. Egyptian politicians had suggested the country should sabotage the project in a meeting with the president Monday. Getachew Reda, a spokesman for Ethiopian Prime Minister Hailemariam Desalegn, said late Tuesday that Egyptian leaders in the past have unsuccessfully tried to destabilize Ethiopia. Ethiopia a week ago started diverting the flow of the Nile toward the $4.2 billion hydroelectric plant dubbed the Grand Ethiopian Renaissance Dam. The project is about 20 percent complete. “The Renaissance Dam is here to stay. It is advisable for all actors of the political establishment in Egypt to come to terms with this reality,” Getachew said in an interview. Since Ethiopia announced it was going to build the dam in March 2011, it has insisted the water flow to Sudan and Egypt will not be affected. It has initiated a tripartite Egypt-Sudan-Ethiopia experts panel to study the impact of the dam. The 10-man panel, which includes four international experts, submitted its report to the countries last weekend. Ethiopia’s Ministry of Water and Energy said the report concluded the dam “will not significantly affect” either Sudan or Egypt. The Nile is a major north-flowing river in northeastern Africa, generally regarded as the longest river in the world. It is 6,650 km long ( 4,132 miles). Egyptian political leaders on Monday met Morsi to discuss the report. Apparently unaware their discussion was being televised live, some of them proposed hostile acts including aiding rebels inside Ethiopia and destroying the dam itself. Ethiopian officials long have accused Egypt of backing anti-government rebels in Ethiopia. More than a dozen rebel groups exist in the East African nation, some wanting more autonomy, others a separate state. Experts estimate that already water-starved Egypt could lose as much as 20 percent of its water in the three to five years that it would take to fill the massive reservoir. 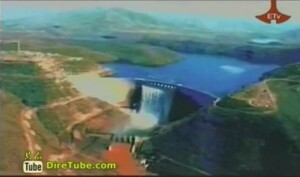 Ethiopia diverted the course of the Blue Nile to make way for ongoing dam construction. The Blue Nile has its source in the Ethiopian mountains and is responsible for 85 percent of the water that reaches Egypt. The live transmission of the politicians’ comments has kicked off an uproar in Egypt’s independent media, with many government critics saying that carrying the meeting live on TV has shown the extent of Morsi’s mismanagement of a national security issue. Egypt’s top reform campaigner, Nobel Peace Laureate Mohamed ElBaradei, has called on Morsi on his Twitter account to apologize to Ethiopia and Sudan on behalf of the Egyptian people for what was said during the Monday meeting. Morsi’s top political aide, Pakinam El-Sharkawy, has apologized on Twitter about not informing participants in advance that the meeting would be carried live. “I apologize for the unintended embarrassment caused to any of the political leaders for not mentioning the live transmission of the meeting,” she wrote. El-Sharkawy moderated Monday’s meeting. The statement, which followed a Cabinet meeting, said Egypt recognized Ethiopia’s development needs and acknowledged Ethiopia’s repeated assurances that it would not harm Egypt’s water interests. Egypt, it added, wanted to quickly start a “political and technical” dialogue with Ethiopia. Getachew said that Egypt’s president told Hailemariam on the margins of the African Union meeting late last month that Egypt will cooperate in the construction of the dam. Getachew said the Ethiopian government has no intention of harming Egypt. “We are not in the business of starving Egyptians to death. We are rather interested in the generation of hydro-electric power and there is nothing that will create any significant harm on the Egyptians as far the building of the dam is concerned,”Getachew said. Ethiopia is currently spearheading a group of six nations that have signed a new Nile cooperation agreement opposed by Egypt and Sudan. The new agreement strips Egypt of its veto power over upstream countries’ projects on the Nile. And no government people will ever say anything they are thinking again. By the way, I still have some Square Meter Buckets® left …. it’s how they measure water volume there. reality,” Short and brief – the simplest way those retard Egyptian politicians could understand (as they should grow up to analyze an in-depth geopolitics of the region and its implication). Maybe the solution is to send more Ethiopians to work as maids in Lebanon, thus reducing power needs in Ethiopia? Ethiopians commenting here are blinded by nationalism. They need to take a step back and take responsibility for the fact that their country is not developed. Egypt is not the reason for this. It is your government. It might feel nice talk tough, but the reality is that Ethiopia is best know for famine, corruption, brutal political repression, and cheap agricultural land leases, and not for its military strength or economic significance. Please wake up to that reality for your own sake. Yes, the great Ethiopian Famine was caused by herding nomadic people into cities – which simply caused the land to die because too many were sucking it dry in one place. Politicians again screwing the people who moved with the weather, understanding nothing of the reasons for a nomadic life. In fact, that action ultimately created more dessert. This dam may pull them back up from the starvations. Yet Egypt should not suffer from the hydro-electric project. Water continues to flow downhill. The problem in both countries is when people keep having more than 2.3 children and increasing population beyond capabilities. When Ethiopia decides it can divert some from the ‘new lake’ to the dessert they created, there could well be a little shortage in the Egyptian dessert. But going to war over it is useless … of course.